The Center features an open lab layout with few walls and partitions between labs to facilitate communication among scientists. A meeting lounge and an open cafe on the 1st floor support active, informal scientific exchange between researchers. English is the official language for all seminars and lab meetings to promote international scientific discourse. 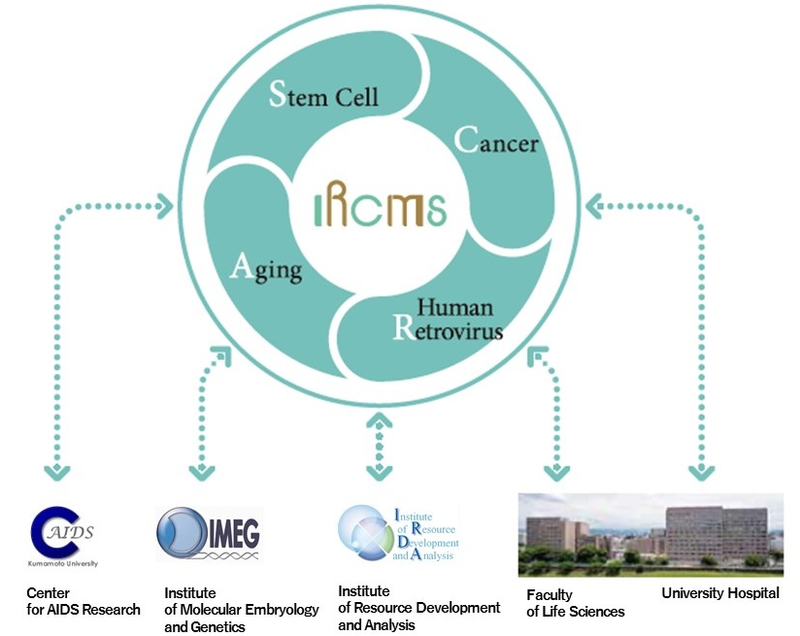 IRCMS is located in the Honjo-Kuhonji area with Kumamoto University's School of Medicine; the University Hospital; the Center for AIDS Research (CAIDS), which is the only institute focusing on AIDS research among Japanese universities; the Institute of Resource Development and Analysis (IRDA), which has state-of-the-art transgenic and knockout mouse technologies; and the Institute of Molecular Embryology and Genetics (IMEG), which covers stem cell biology. Through cooperation with these institutes, IRCMS will create a strong collaborative network in the areas of Stem Cell Research, Aging Research, Human Retrovirology and Cancer Research. At present, 15 principal investigators (PIs) and their lab members have been conducting research at the Center. IRCMS is recruiting independent PIs at the associate professor level or higher from all over the world who have a track record of international collaboration and are actively engaged in collaborative research. IRCMS also aims to establish an international research collaboration network with visiting researchers who hold positions in research institutes abroad. Non-Japanese nationals currently account for 40% of the people working at the Center, excluding visiting researchers, and this number is expected to increase to 50% in the future. The ultimate goal of IRCMS is to become a successful and innovative role model for the internationalization of academic research. IRCMS is now laying new framework that extends beyond the existing research environment to reach this ultimate goal.